(Bloomberg) -- Oil hovered near a four-month high as a rising dollar capped crude’s rally. Futures fell 0.4 percent in New York, after climbing above $60 a barrel on Wednesday for the first time since November following a U.S. government data showed the biggest crude draw since July. But the dollar’s Thursday gains undermined investors’ appetite for crude and other commodities priced in the U.S. currency. 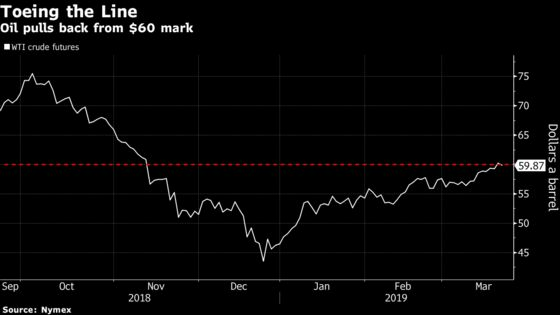 “It’s a little bit of pull-back after what still amounts to a pretty sizable run in the past two weeks,” said Kyle Cooper, an analyst at Ion Energy Group in Houston. Crude has gained more than 30 percent in 2019 as output reductions by the Organization of Petroleum Exporting Countries and its partners, as well as supply disruptions in Venezuela and Iran, countered growing American shale production. Still, the gains have been checked by concerns that a slowing global economy and a protracted trade dispute between the U.S. and China will impede fuel consumption. WTI for May delivery lost 25 cents to settle at $59.98 a barrel on the New York Mercantile Exchange. Brent for May settlement was down 64 cents to $67.86 a barrel on the London-based ICE Futures Europe exchange. The global benchmark crude was at a premium of $7.88 to WTI. American crude inventories declined by the most since July to 439.5 million barrels last week. The country’s crude exports were near a record high, imports from Saudi Arabia fell by more than half and shipments from Venezuela stopped completely. Still, surging U.S. production, which rose again last week to a record level of 12.1 million barrels a day, continues to undermine OPEC and its partners’ effort to trim a global surplus. The review process for Swiss trader Trafigura’s Texas Gulf Terminals has been delayed to allow authorities more time to review the proposed offshore oil terminal project, according to the company. Petroleo Brasileiro SA is aiming to get about $10 billion from the sale of refineries as it pushes ahead with streamlining its business to focus on crude production, people with knowledge of the matter said. It has retained Citigroup Inc. as an adviser.